I’ve been asking artists to let me into their creative spaces for a few years now. From the beginning of this series my motive has always been to create a space to showcase and capture the creativity of those featured. Every time I entered an artists space I felt a thrill and a spark of excitement as I was welcomed into their sanctuary. Their space that they feel most at home to create. Every single time I had wrapped up and left, I couldn’t help but leave with such a sense of inspiration to continue pursuing my own creativity. 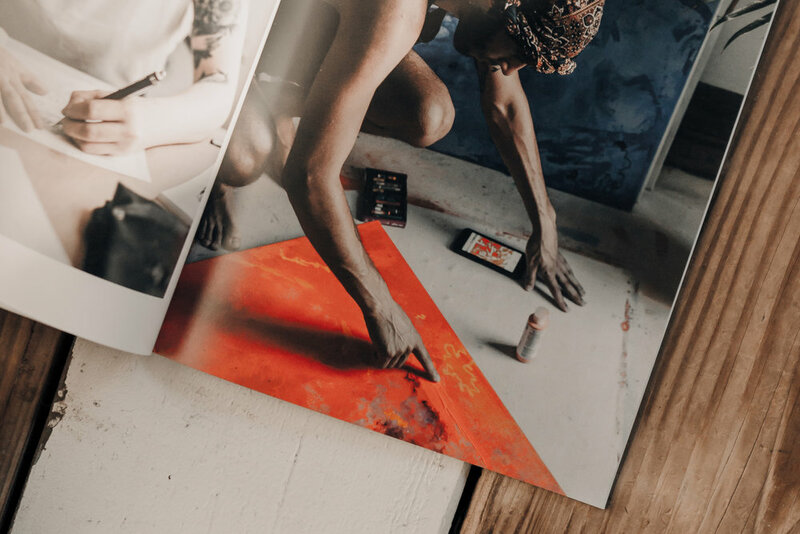 When Blurb approached me to help share about their book-making and publishing platform, I immediately knew that I wanted to use this opportunity to curate my series on artists. My interviews haven’t been flowery stories, they’ve been straight-forward conversations between myself and the artists. I’ve asked simple questions to help tell the story of their artistic journey in an honest format. So now that you know the why, let’s get down to how I used Blurb to make these stories into a physical object I could hold and share. I’ll break it down into the easy steps I REALLY took to create my project, which I called “Motive”. 1: Choose your format. I’m a sucker for print journals and magazines, and wanted to indulge that love into my own foray. Because of this I was stoked that Blurb had a great magazine format to chose from. If you’re not sure which format you want to print, it’s easy to have them send you a swatch kit so you can feel + see all of their paper options. If you order a swatch get for $7.95, you’ll receive a promo code that lets you apply the cost of the kit toward your book purchase. 2: Design! Again, they’ve thought through the entire process… No need to design this in another software, you’re able to use their BookWright desktop tool to get all your images and words in just the right place. 3: And then I was ready to order! I spent a bit of extra time to order a proof copy just so I could see how everything looked in my hands. Turns out everything was ready to go! Now that I have my finished project in my hand, the sense of pride I feel is beyond words. I’ve seen my work in print a couple of times, and the feeling still hasn’t gotten old. It’s 2018, and now more then ever we are living in a digital culture that rarely gives us tactile experiences of imagery or words. Because of that, having this opportunity to tangibly showcase my own work was priceless. 10/10 would recommend!